I need to go bashing into the forest proper more often. The insects and spiders that dwell in the open and on the fringes of the woods are wonderful for sure, but there are whole new worlds in the deep and damp layers under the canopy, where the sun shines in diffused columns that form a shifting column of light on the forest floor. 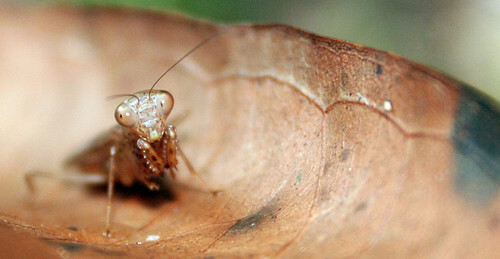 The creatures are shyer (some like this mantis lurk within the leaf litter) and their structural defences more vigorous: the petioles of shade-loving palms are laced with flesh ripping spines and battalions of biting ants patrol every available pathway. Even lacewing larvae and thrips, no bigger than a coma, plunge their jaws into the skin with palpable pain. Yet in these dark corners are crawlers and creepers that defy instant classification and may well be absent from all but the most obscure journals. Every turn of the head and clumsy sidestep of a thorny sapling sends legions of legs into hidden shelters. 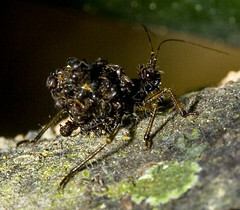 This bristly insect pictured above right is one such example. It appeared as a mere protrusion of bark on the side of a trunk untouched by day and gave itself away only by a slight wave of its antennae. After enduring a sudden strike of illumination, it crept further down into unreachable crevices. What is it ferrying on its back? A brood of nymphs or a more macabre burden of fainted formicids? What dramas of life and death have these bright eyes seen in the chamber of secrets that lie in every tree and die with its felling? Update: the good folks at the Nature Photographic Society forum set me going on the right trail and it looks like the beast is in fact a kind of assassin bug that specialises in ants. 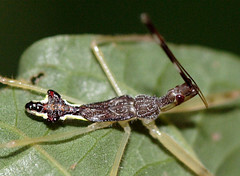 After piercing and sucking dry its prey, it impales the corpses on the abdominal bristles to form a ghastly coat of arms. 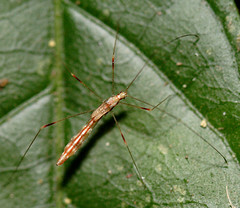 With some 6,000-7,000 species, the family Reduviidae is a formidable group of predators that appear superficially like other plant-sucking bugs. 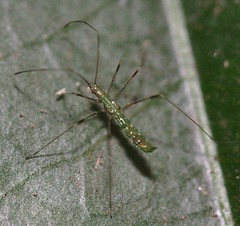 However, a prominently long and segmented rostrum marks their identity as some of the insect world's nastier killers. Enzymatic juices paralyse and liquefy prey animals before the bug sips a meal of beetlejuice. 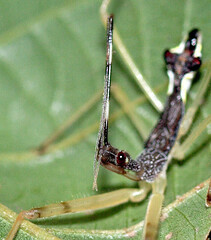 The saliva of some innocuous-looking species is toxic enough to cause temporary blindness. In South America, an assassin bug known as the 'vinchuca' creeps into beds at night and spreads the heart-stopping Chagas' disease via its faeces. While some Reduviids look like harmless squash bugs, others are lean, mean prowlers, like this skinny trio I found in the forest near Wat Phrathat Doi Suthep in Chiang Mai. The little green guy and fellow with orange-and-white stripes look pretty unoffensive to me, but the darker bug seems well able to inflict a horrid poke in my duck with its monster of a rostrum. With such arsenal, one wonders why it needs a false head on its abdomen. But no creature, not even the stealthiest of stalkers, is beyond the grasp of some foe with the specialisation and skill to turn the hunter into ham, and some wasp or fly could well be the nemesis of this leggy leafhugger.